Ambitious HR specialists are hard at work following-up a wealth of exciting new leads after showcasing their expertise at a major business event in London. 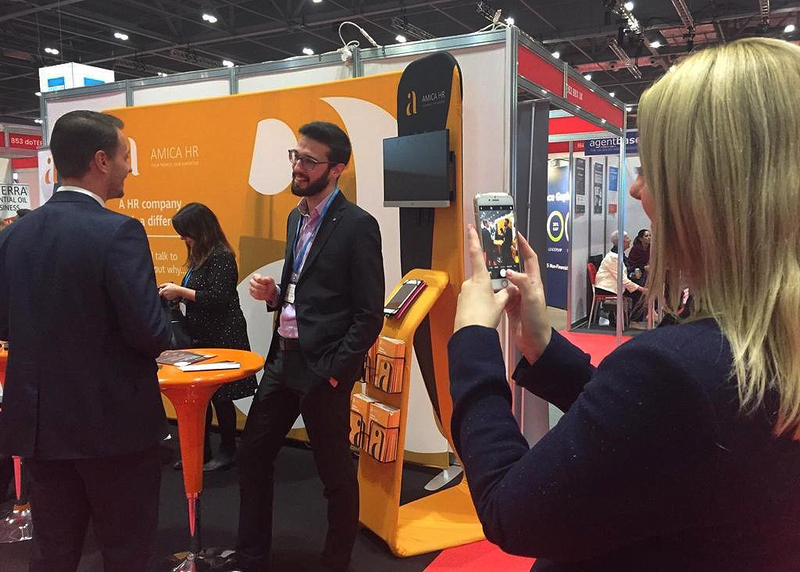 There’s a real buzz in Amica HR’s headquarters at the Think Tank in Lincoln, thanks to the fantastic response its team received from many of the thousands of visitors who flocked to The Business Show at ExCel in London. Directors David Grech and Suzanne Tricker, along with three of their colleagues, attended the two-day event to promote their wide-ranging expertise and tell delegates they have expanded and opened a London office. Amica HR was really pleased with its position at the Exhibition, the style of its stand and the fact that the firm quickly attracted professionals from across the UK and abroad who were keen to hear about its services. David said: “We decided to do things a bit differently to many other exhibitors, by having a “boutique” stand, which was easily accessible and made it easy for people to stop and chat. “Fortunately, we were also just yards away from two networking areas. That was a real plus point because it encouraged extra enquiries. “Outsourcing was a hot topic. It was amazing how many businesses wanted to know how outsourcing their Human Resources function could help them to reduce their overheads whilst still keeping-up with today’s ever-changing legislation. People were interested to know that we are headquartered in Lincoln, but have opened a London base, in line with the growth of our client base in the south and our partnership working in that area. Amica HR introduced its London office colleague, HR Consultant and Coach Julie Greaves and its Lincoln-based HR Manager Katina Gray and Employment Lawyer Lucy Stones to delegates. “That was helpful because it ensured visitors realised the combined experience of our team” said Suzanne. “Whilst we were at the show, we met some great speakers, such as the UK’s No.1 Motivational Business Speaker Brad Burton.